Jefferson County Health Center, Iowa’s oldest county hospital, was dedicated September 17, 1912, and opened October 2, 1912. 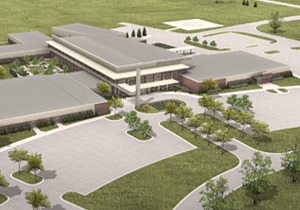 A bond issue of twenty-five thousand dollars was voted to build the 3-story, 25-bed hospital. This was only the second time in the history of the world that rural people voted a tax on themselves to build a hospital. Private donations furnished and equipped it. Our hospital established a nurse’s education program in 1912, graduating a total of 63 nurses, and remained active until 1932. In 1917, the physicians and nurses formed Unit R, a Red Cross volunteer group, which was attached to the U.S. Army and served in France during World War I under the leadership of Dr. Clark. Dr. Agarwal has affiliation and privileges at Jefferson County Health Center in Fairfield, IA since 1997 and is available to see patients there on 2nd Thursday of every month. Please call 1-888-226-0990 to schedule your appointment.